So you’re a tradie and you’re looking for easy to use invoicing software? Who doesn’t love a good stereotype, eh!? Whilst we know that this list doesn’t come close to ringing true (for some it surely will), we do know that computers and invoicing software are most definitely not loved by the majority of tradespeople. Below, we will take a look at the various different paths you can take when invoicing your clients. Yes, some tradies will still do their invoicing using the good ol’ pen and paper. Old habits die hard they say, but invoicing your clients using hand written invoices is really an archaic practice that should be left in the past. Usually we find that the people writing out manual invoices are a little older and have been doing it this way for years. They may have never really been taught how to use a computer and generally shy away from ‘modern technology’. But quiet often we find that they would also be carrying around a smartphone in their pocket – if you can use a smartphone, you can use online invoicing software! You can even use Simple Invoices on your smartphone whilst on site. As you can see, we think that online invoicing is a much better solution (but we are biased of course). Learning to do something new is a daunting task, so if you are having difficulty making the leap into the online world of invoicing, please don’t hesitate to reach out to us and we can walk you through the whole process over the phone – simply visit our contact page and leave us a note to give you a call at whatever time best suits you. Using a Word or Excel template for your invoicing is a significant step up from a manually written paper invoice, but still lacks many, many features that will save you time and money in your invoicing. A lot of tradies will go down the template route when first starting out, but often very quickly find that they are spending too much time doing their invoices, tracking them and keeping them organised. 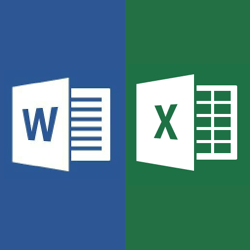 The Word/Excel invoice templates themselves are actually pretty decent and it’s not too difficult to get a nice template design up and running. Some of the Excel templates will also have automatic calculations and some even have preset items that you can use. The major drawbacks of using these templates however is that you need to be very organised and keep a ledger to track payments and amounts owing, you can’t accept online payments, you can’t track when users view the invoice, they take more time/more brainpower and your invoices are probably only available on the 1 computer you use. Using dedicated online invoice software takes care of all these issues. You can easily see all of your invoices at a glance and they can be sorted, filtered and searched easily, you can see when your client has opened and viewed your invoice, your clients can pay for your invoice online (you can still choose offline payments as well) and you can create, view, edit and send invoices from any device, anywhere in the world. We have made it past the handwritten paper invoices and have moved on from the Word or Excel invoice templates. Now it is time to look at dedicated invoicing solutions and to choose between online software or downloadable software that you install on your computer. It is great to be at this point as it means you are now looking at a dedicated program that is built specifically for the job and that will allow you to spend less time on your invoicing. Now the decision must be made whether to go with software that you install on your computer or software that is available online. Downloadable invoice software will only work on the computer that you install it on, which may or may not be an issue for you. If you need to use the software on another computer or another location then you would need to install the software agan on that computer. This is the major drawback of software that needs to be installed. This is where online invoicing programs really shine. They are accessable from any computer, any tablet or any smartphone. So if you are out on the jobsite and need to create an invoice, create a quote, send an invoice, edit an invoice, view client info or anything similar then it is as easy as pulling out the smartphone. Is Simple Invoices good for tradies? Simple Invoices is exactly as it sounds. It is simple and easy to use invoicing software, perfectly suited to tradespeople, sole traders and contractors. Simple Invoices does not have all the bells and whistles of some of the larger, more expensive invoicing software, which is great because that’s what makes it so easy to use. There are less options and less clutter to allow you to bang out invoices and quotes with ease. The simplicity or the complexity of your software requirements will vary depending on your business and your specific needs. Simple Invoices is squarely targeted at small businesses and sole traders. If you’re a 1 man show or have just a few employees, we might be the ideal software for you! So, Mr or Mrs Tradesperson, are you ready to start saving time doing your invoices? If so, simply add your email below to create your first quote or first invoice. Free of charge, no strings attached. 30 days to try us out.